2-family house "Frano". 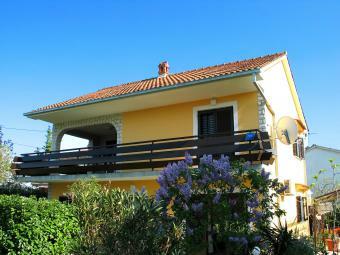 1 km from the centre, 200 m from the sea, 200 m from the beach, on a main road. In the house: internet access, washing machine. Parking at the house on the premises. Shop 100 m, pebble beach, rocky beach 200 m. On the ground floor: place of business. 3-room apartment 68 m2 on 1st floor, south facing position: living room 16 m2, with sloping ceilings with 1 sofabed (100 cm, length 190 cm), cable TV, international TV channels, CD-player, DVD and air conditioning. Exit to the balcony. 1 room with 1 double bed (2 x 80 cm, length 200 cm). 1 room with 1 double bed (2 x 80 cm, length 200 cm). With sloping ceilings, open kitchen (oven, dishwasher, 4 ceramic glass hob hotplates, microwave, freezer) with dining table. Shower/WC, hydro massage shower. Balcony 4 m2. Balcony furniture. Facilities: Internet (WiFi, free).